Anne Katrine de Hemmer Gudme is Professor with special responsibilities at the University of Copenhagen. These past couple of weeks, I have been working on a paper on Aramaic dedicatory inscriptions containing a remembrance formula which I am going to present at the ARAM Society’s conference on sacrifices and offerings in the ancient Near East in late July. Remembrance formulae are well-known in Aramaic inscriptions and graffiti in the Eastern Mediterranean where the phrase “for good remembrance” and the more common “may he/she be remembered for good” is widespread in inscriptions dating from ca. 200 BCE to 300 CE. This has made me revisit parts of my doctoral thesis on the votive inscriptions from Mount Gerizim and to think further on the relationship between materiality and divine remembrance in these inscriptions. In my thesis and in the paper that I have been working on, I compare the Gerizim inscriptions with other Aramaic remembrance inscriptions, but in this blog post I shall focus on the Gerizim inscriptions. 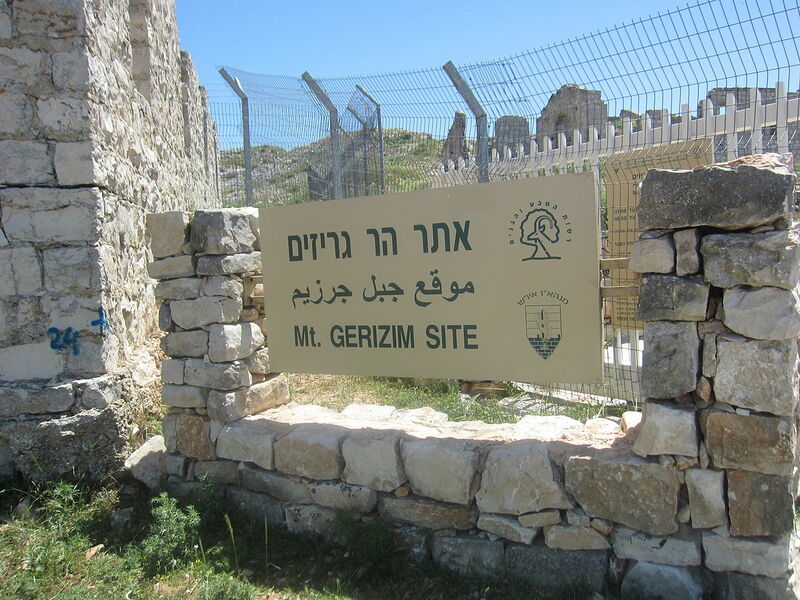 The site of Mount Gerizim. Source: Ovedc – Eget arbejde. Licensed under CC BY-SA 3.0 via Wikimedia Commons. Mount Gerizim is situated south of the modern city of Nablus on the West Bank. During recent excavations on the mountain’s main summit, Jebel et-Tur, a sacred precinct and a surrounding city were excavated. The precinct dates to the latter half of the 5th century BCE. The city, which was founded in the late 4th century BCE, grew up around the sacred precinct. The Aramaic votive inscriptions probably belong to the second building phase of the sanctuary which took place in the first half of the 2nd century BCE. Both the precinct and the city were destroyed by the Hasmonean king John Hyrcanus I in 111-110 BCE and the area remained uninhabited after that until the Byzantine period. When one visits the site today the octagonal Byzantine church of Mary Mother of God (theotokos) is one of the most conspicuous structures on the mountain. Gerizim Byzantine church. Source: Deror_avi – Eget arbejde. Licensed under CC BY-SA 3.0 via Wikimedia Commons. 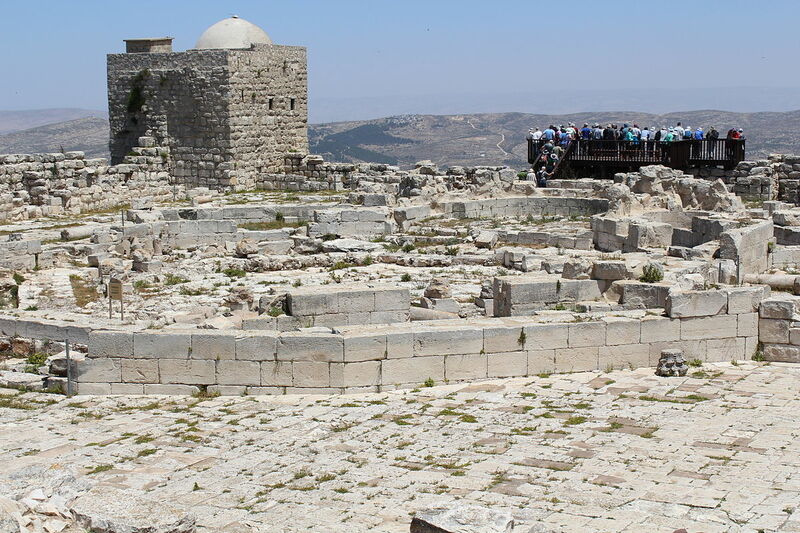 So far I have referred to the sanctuary on Mount Gerizim as a sacred precinct. This is because no actual temple building has been found on the site. The structures discovered there are mainly surrounding walls and ancillary rooms. However, the vast amount of bones and ashes discovered at the site combined with the dedicatory inscriptions confirm that there was a sanctuary dedicated to Yahweh on Mount Gerizim and that a large-scale sacrificial cult was carried out there. Mount Gerizim is usually identified with Samaritanism, perhaps most famously in the Gospel of John chapter 4 in the conversation between Jesus and the Samaritan woman at the well. Iconostasis from the village Skvariava Nova, Lviv Oblast showing Jesus and Samaritan Woman, painted by Ivan Rutkovych. Source: Mykola Swarnyk. Licensed under CC BY-SA 3.0 via Wikimedia Commons. 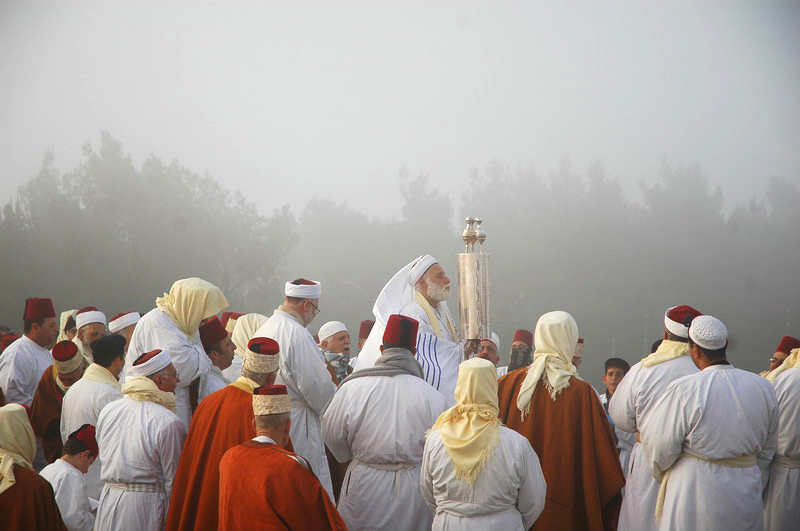 Samaritans marking Passover on Mount Gerizim, 2006. Source: Edkaprov. Licensed under CC BY-SA 3.0 via Wikimedia Commons. Mount Gerizim is a holy place to the present-day Samaritan community that lives primarily in Ḥolon and Luzah in Israel and Palestine. Luzah is the modern Samaritan village on Mount Gerizim to which the Samaritans in Nablus have moved during the past 15 years or so. The Samaritans ascend the mountain on a pilgrimage three times a year during the festivals of Pesach, Shavuot and Sukkot. There is nothing distinctly ‘Samaritan’, however, about the ancient sanctuary on Mount Gerizim in the Persian and Hellenistic periods. The sanctuary and the dedicatory inscriptions are best seen as remnants of ‘Samarian’ or Northern Yahweh-worship in the 5th –2nd centuries BCE. They offer us a window to votive practice performed by Yahweh-worshippers in the 2nd century BCE regardless of later developments in Samaritan religion. The assemblage of Aramaic dedicatory inscriptions from Mount Gerizim consists of roughly 380 more or less fragmented inscriptions. Unfortunately with only one exception none of the inscriptions were found in situ but it seems that the stones they were inscribed on all belonged to the same structure built of dressed unplastered stones. It may have been an inner wall in the sacred precinct separating the innermost part of the sanctuary from the outer courtyard, but this is only guesswork. It is possible of course that the implied object of dedication in each of the Gerizim inscriptions is the actual stone on which the inscription is written. However, since at least some of the inscriptions are clearly inscribed on the ashlars after the structure that they were a part of was built, it seems more reasonable to assume a broader range of dedications, such as monetary gifts and sacrifices, which then gave the donor the right to have an inscription made in the sanctuary. It is noteworthy that several of the inscriptions contain the preposition ‘before’ or ‘in front of’ the deity. This specific reference to location seems to stress that it is important to the function of the inscription that it is placed exactly in a sanctuary setting in front of the place where the deity is thought to be in accordance with a classic Ancient Near Eastern theology of presence. In 52 of the Gerizim inscriptions, the ones that seem to follow the long dedicatory formula, a counter-gift of good remembrance is requested in return for the gift given to the deity. Apart from the inscriptions that are brief and formulaic, there are no religious texts from Mount Gerizim. But if we look to the Hebrew Bible there are indications of what it means to be remembered favourably by a deity. Generally, in biblical literature Yahweh’s remembrance entails more than just a cognitive exercise to recall past events. To be remembered by Yahweh is thought to have a palpable and positive effect for the person remembered. For instance Yahweh remembers Noah in the ark in Genesis 8:1 and makes the waters withdraw; and Yahweh remembers the childless Rachel in Genesis 30:22 and opens her womb and similarly in 1 Samuel 1:19 Yahweh is said to remember Hannah and she conceives a son. On the other hand, not to be remembered by Yahweh is described as similar to death. For instance in Psalm 88:6 where the Psalmist compares himself to “…the slain who lie in the grave, whom you do not remember anymore”. 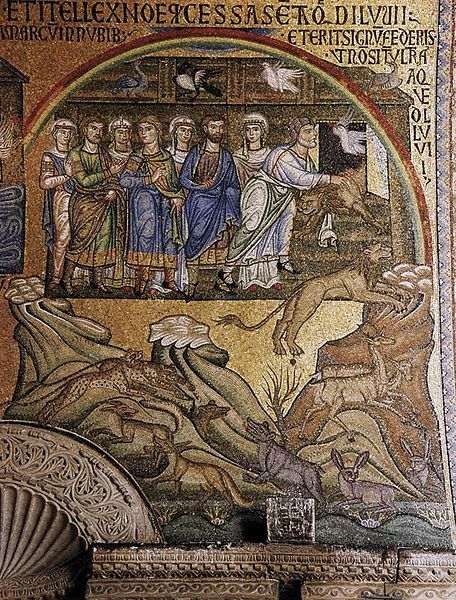 Stories of Noah: the Rainbow (Venice, ca. 1200-1250). Yahweh’s positive remembrance is more or less identical with divine assistance. In relation to this, it is interesting to note that Yahweh is described as using physical reminders of things that he wants to remember. Perhaps the best example of this is in Genesis 9, where Yahweh places his bow in the sky as a sign to remind him of his covenant with Noah. And he says to himself: “When the bow is in the clouds, I will see it and remember the everlasting covenant between God and every living creature of all flesh that is on the earth” (9:16). In this text, the rainbow works exactly like tying a piece of string around one’s finger in order not to forget something. Along a similar line of thought, in the ritual texts in the Pentateuch, Yahweh’s remembrance can be evoked by means of ritual, where physical reminders are brought inside the Holy of Holies where Yahweh is residing or placed in front of it. For instance in Exodus 28, where the gemstones on the High Priest Aaron’s breastplate that are engraved with the names of the twelve tribes of Israel are to be “a continual remembrance before Yahweh” (28:29). 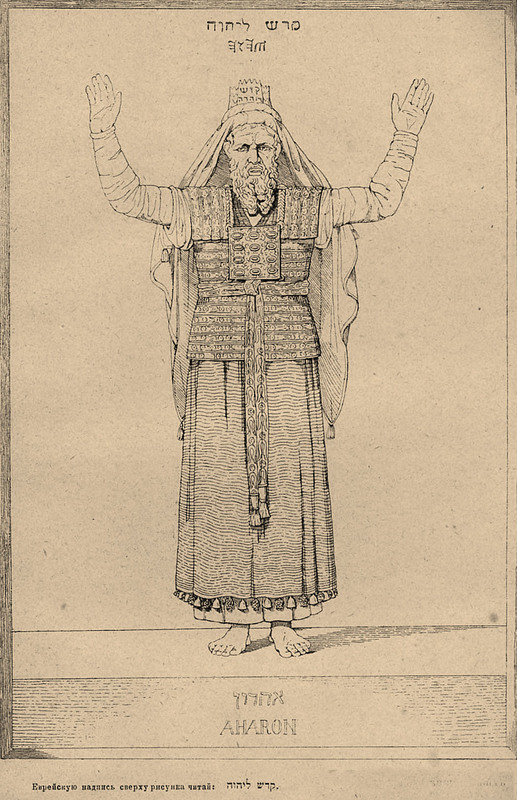 Illustration from Brockhaus and Efron Jewish Encyclopedia (1906—1913). The engraved stones underline Aaron’s cultic role as the representative of the entire people and as the only person permitted to enter the Holy of Holies he brings the people of Israel to Yahweh’s attention by physically bringing a reminder of their existence into Yahweh’s presence. It is noteworthy, that this concept of divine remembrance as something that can be evoked through ritual by placing a material reminder in front of the deity is very close to what seems to be the rationale behind the remembrance inscriptions, where a physical reminder, the inscription, is placed in front of the deity in the sanctuary in order to bring about divine remembrance. The wording of the inscriptions explicitly ask for divine remembrance and all the blessings that this entails, but the remembrance of the deity is not obtained by the words alone, it is secured by the continued physical presence of the inscription in front of the deity where it functions as a permanent reminder of the donor. The materiality, durability and specific location of the inscription become of prime importance, because it allows the memory of the worshipper to linger in the sanctuary and to outlast the smell of the sacrificial smoke and the echo of the prayers. In this way, the inscription becomes a stand-in for the worshipper and enables him or her to have a continued physical presence before the deity and therefore hopefully to have a permanent place in the deity’s thoughts.